What do you know about mind control dear readers? Daresay I say it, but I hope the answer is nothing. Not because your minds have been wiped, but because it’s a really weird and controversial topic and I’d rather stay away from conspiracy theories if I can help it. But they are theories… So maybe I will write about them sometime. Anyway, today’s Theatrical Tuesday entry is about mind control. But is the movie worth watching or should you forget I ever shared it with you? From the guy that brought you Project X and literally nothing else so far. Nima Nourizadeh is a fairly green Iranian-British director. Before he he made Project X (and American Ultra) he made music videos for Dizzee Rascal, Pink Grease, Franz Ferdinand, Bat for Lashes, Santigold, Hot Chip, Yelle and Lily Allen. Interestingly enough I think directing music videos helped him get his first gig (Project X) which was a giant party movie, and in turn this movie, which is a stoner/action movie. It’s all about proper transitions, dear readers. But what is the story about? Mike Howell (Jesse Eisenberg) is in a holding cell, waiting to be interrogated. A man enters, while another watches and Mike experiences flashbacks of the past few days. Cut back to Mike in West Virginia with his girlfriend Phoebe (Kristen Stewart). He had planned a trip to Hawaii where he was going to propose, but they missed the flight because he was having a panic attack in the bathroom. Coming back from the airport, they are stopped by the local sheriff, who has a longstanding relationship with Mike. He then returns to his job at the local convenience store, which is incredibly dull. Victoria Lasseter (Connie Britton) is a CIA agent reviewing files that is interrupted by former assistant Petey Douglas (Tony Hale). She receives a scrambled phone call saying “Tough Guy” is moving in on the “Little Man”. She confronts Adrian Yates (Topher Grace) because he is responsible for Mike and a program she made called Ultra. Yates says Mike needs to be terminated and mocks Victoria before kicking her out of his office. Mike and Phoebe getting high on the hood of his car while they watch a tow truck and several cops remove a crashed car from a tree. Mike starts to cry because he believes the tree stopped the beautiful car and that he represents the tree while Phoebe is the car. She tells him that is not true. The next day, Mike meets his drugdealer Rose (John Leguizamo) to pick up fireworks in order to propose to Phoebe. Back at the convenience store, working a night shift, Victoria approaches Mike and speaks code to him. He looks confused, and she leaves. When Mike goes outside to smoke he sees two guys with his car. He confronts them and they pull knives. Instinctively Mike reacts by throwing hot soup at one attacker and stabs the other guy in the neck with a spoon. He then shoots both of them. He calls Phoebe, who comes over in time for the sheriff to stop by and arrest them both. Yates realizes that Victoria has “activated” Mike. He orders two Tough Guy agents, Crane (Monique Ganderton) and Laugher (Walton Goggins) to eliminate Mike and Phoebe, and locks down the town. The agents kill all the police but Mike and Phoebe escape the firefight. Just as they are leaving Crane throws a grenade, but Mike catches it, and throws it back, blowing up the station. The couple go back to the store. But Mike freaks out, and Phoebe calms him, while his is happening a bag blows onto Mike’s car, setting off an explosion. They stare in disbelief. Stop! Hammer Time. But seriously, I don’t want to give you any more plot. Pros: I continue to think that Kristen Stewart and Jesse Eisenberg work well as an on-screen couple and look forward to seeing them in the new Woody Allen pic. Topher Grace and Connie Britton also played well off of each other. The cinematography and pacing were also excellent. Cons: It doesn’t quite reach that level of absurdity, violence, and comedy that would have made it a 9 or a 10. We needed a little more of everything. Points of Interest: The movie is a reference to the MK Ultra program that the CIA develop to combine American and German information about the subject of mind control. This is the second movie that Kristen Stewart and Eisenberg made that has a character potentially go into anaphylactic shock. If you’ve never heard of MK Ultra, and your interest is piqued, give it a shot. If you’ve never heard of MK Ultra, and your interest is piqued, give it a shot. 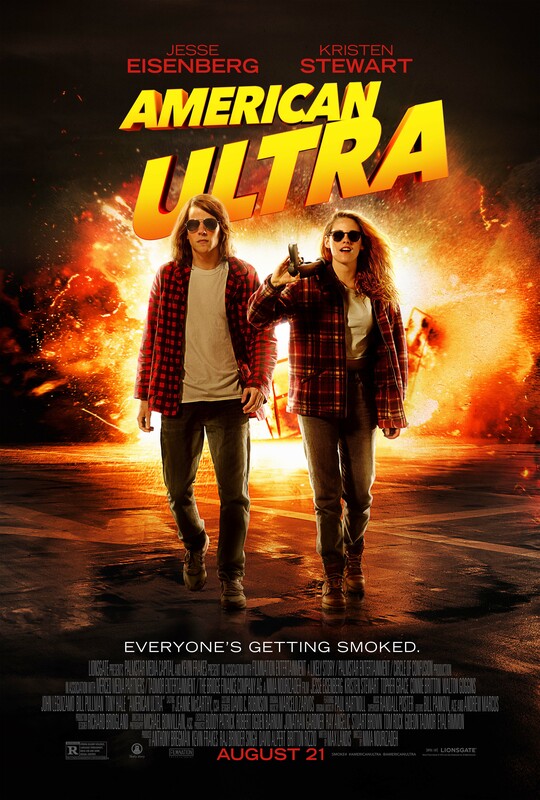 If you’ve never heard of American Ultra… It’s a fun movie, give it a shot. What were we going on about again? Oh right mind control. What do you know about mind control dear readers? Daresay I say it, but I hope the answer is nothing. Till next time!